Abstract. When colonizing a new area, introduced species may lose their original haemoparasites. If the local parasites are unable to infect the novel introduced hosts, these may gain a fitness advantage over their local competitors. Alternatively, the introduced species may be susceptible to local parasites and enter the local transmission dynamics. We studied these two possibilities in communities of wetland passerines infected with haemosporidians (genera Haemoproteus and Plasmodium) in Portugal, southwest Europe. Four introduced and six native (resident and breeding migrant) passerine species were tested for haemosporidians in four reed beds. Our results suggest that the introduced species have lost their original haemoparasites upon colonization and entered the local transmission cycle. Two local Plasmodium lineages infected the exotic species: one of them (SGS1) was the most host generalist and prevalent lineage in the native species, so was expected to be present in the exotics at random. The other lineage (PADOM01) was rarer in the sampled community, but was present in native hosts that are phylogenetically close to the infected exotic species; therefore, the colonization of the exotic host by PADOM01 seems to be constrained by the parasiteâ€™s specialization and by phylogenetic factors. When phylogeny was controlled for, there were no significant differences in infection prevalence and number of lineages between exotics and natives. 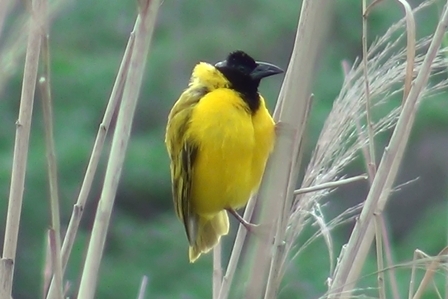 Photo: Black-headed (Yellow-backed) Weaver, escapee in Cape Town (from phown 1221).